Born in Leigh-on-sea, Essex, Elspeth studied at King's College, London, Trinity College of Music and Royal Academy of Music. She has performed at venues including St John's Smith Square; Linbury Studio, Royal Opera House; Hackney Empire and St James', Piccadilly and has worked with BBC Wales, Royal Ballet, Royal Shakespeare Company, Lesley Garrett and Southbank Sinfonia amongst others. 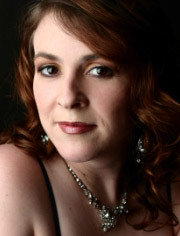 Elspeth has worked as a repetiteur/musical director with Opera up Close, Co-Opera Company, Merry Opera Company, Opera Brava, Northern Ireland Opera, Riverside Opera, Tête à Tête Opera and Opéra de Baugé, playing continuo on several of their productions and acting as chorus master since 2011. In addition to her work with TCS, Elspeth works as an accompanist/assistant conductor with Barnes Choir. She is also a member of The Argento Trio (soprano, clarinet, piano) and The Bridgetower Trio (violin, 'cello, piano).